Nearly five hundred Firefighters doused the smouldering ruins of Notre-Dame with water on Tuesday, the morning after a raging inferno swept through the Gothic cathedral in the heart of Paris as investigators tried to establish what started the fire. 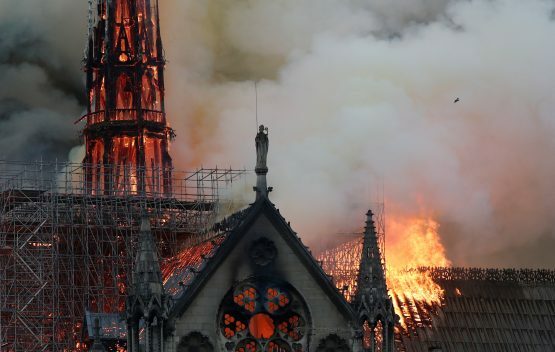 The pledge came after Arnault´s crosstown rival Kering, the fashion group founded by fellow billionaire Francois Pinault, offered 100 million euros to help “completely rebuild Notre-Dame”. Paris Mayor Anne Hidalgo also said Tuesday that the city would unlock 50 million euros, and would propose holding an international donors´ conference in the coming weeks to coordinate the pledges to restore the gothic architectural masterpiece. The privately run French Heritage Foundation has already launched a call for donations on its website — http://www.fondation-patrimoine.org — while several pages were set up on the Leetchi fundraising portal.